Writing reviews is a tricky business. One tries to be objective and in the end arrives at mostly subjective. Try writing a review for audio equipment, like for speakers, often the quickest way to create a flame-out with audiophiles (even with qualitative test data)*. Writing about different types of music is also a challenge; some folks just don’t like Bluegrass, Jazz or Folk music, for example. Writing about Ambient, Electro-Acoustic, Electronic or other types instrumental music often proves to be the most challenging. Many listeners just can’t grasp (we’ll call it generically) “ambient” music since there are often limited tangible melodies, lyrics or other references unless there’s an artist’s statement or a known concept behind a given work. I find that when writing about instrumental music, it’s most helpful to reference the work of other artists (who might be familiar reference points) or try and describe how the music makes me feel, or what I see or where it takes me. Often, music enhances experiences, and at times nothing is better than a restful sonic journey to the quietude, and Below helps to get us there. I’m more familiar with David Wenngren’s work as Library Tapes, Murralin Lane and other collaborations, but Jonatan Nästesjö’s work is new to me (and he also has used the nom de plume Woodchucker for some of his earlier work). Both are from Sweden. 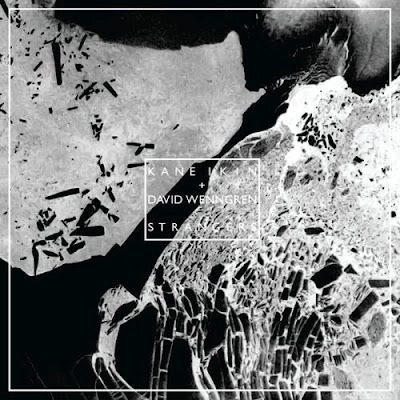 Instrumentation in this work is not readily identifiable compared to most of what I know of David Wenngren’s work, but as a point of reference I’d place Below closest to Wenngren’s recent collaboration with Kane Ikin entitled Strangers. From the first gentle whispers of the ineffable Something There to the broadest fullness of choral passages of Still Nothing Moves You this album presents an ever-changing yet serene oasis of sound. There is mystery within, and a sensitive audio system is almost essential for this album (*-you pick whether the music is through speakers or headphones, and no, I won’t advise on what system is best). Throughout Something There are fleeting ethereal apparitions that emerge from high up and then they are absorbed back into the haze. Part way through the piece there is a moment where the dream subsides, and seemingly the mind reaches back into the scene to complete it, before it disappears into the ether. Feel Nothing appears as if from the edge of a drifting consciousness—at times the faintest of voices can be heard. One floats through time, soft sound-light appears and diminishes and there are moments when a tangible clarity focuses, but it’s still gentle as one moves through the broad spaces created by the music (hence the term often used to describe this type of music: “cathedral electronic music”), yet this album resists being majestic. Before I Leave is more intimate and centered initially, and then almost undetectably a tide (of organs, perhaps) builds on loops and expands as if rising and withdrawing on a broad sandy coast before receding slowly back to the horizon. Still Nothing Moves You closes this sonic novella with veiled choral and Mellotron-like flute passages and after building the sound is gradually lost in the distance. The effect is reminiscent of Holst’s Neptune [The Mystic] from The Planets. Whether leaving a listener with a feeling of walking through a quiet forest (as depicted on the album’s cover), on foot in gentle breezes at a beach or escaping to another realm, Below is a fulfilling and tranquil way to leave the here, for the there. I don’t know exactly on what plane Kane Ikin exists, but I can tell you that I’d like to get there. There is a sense of deep mystery, the fleeting ethereal and a curious otherness in his musical travels. I’ll gladly get on his spaceship, anytime. 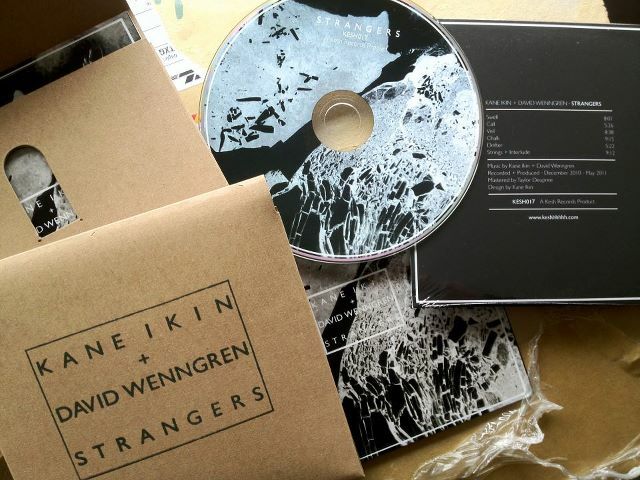 Kane Ikin is one half of Solo Andata (along with Paul Fiocco, both being from Australia), and he has also collaborated with other artists including David Wenngren (aka Library Tapes) on their February 2012 album Strangers (KESH017). I first encountered Solo Andata’s work in the 2009 self-titled 12k release. Earlier this year, Ikin gave us a taster EP entitled Contrail (clear vinyl 7”, and a separate download of four tracks), and the title track alone was worth the price of the entire EP, not to mention the marvelous job that 12k did with the packaging. Also, of note, Sublunar is packaged in 12k’s new (no plastic, and I assume, recycled cardboard) sleeve design. Ikin’s music is decidedly lo-fi in production (tape loops, altered field recordings, sampling, warped instrumental recordings), but the quality and care that he takes in combining tangible instrumentation with highly manipulated sounds gives the end result an indescribable yet comforting quality. His solo work also tends (so far) to focus on shorter format recordings (the longest track Oberon on Sublunar is 4:51). Also, while I consider his work to be highly original in form and sound; there are occasional (intentional?) references to works of others. At the risk of driving my readers bonkers, I’ll again reference Kraftwerk and their track Kling Klang from the 1972 album Kraftwerk 2, which came to mind when I first heard the gongs and bells in track (6) Titan. Sublunar is a series of short journeys, just enough time to experience the sense of place Ikin is depicting, but not so long that one feels the urge to get to the next destination too quickly. I’m going to resist the temptation to describe each track (there’s a full single track sound file for Europa and an Experimedia sampler of excerpts from the entire album), because I think that might diminish a sense of self-exploration for the listener. Some tracks meander with little guidance from a recognizable beat, whereas others have highly treated percussion with extended decay. I especially like how Kane treats the sound of strings in the mix; he uses the entirety of an acoustic guitar’s resonance. Sublunar is a potent musical experience, and I hope Kane Ikin continues his voyages of experimentation, because I’m completely hooked. Music takes me places, always has. Sometimes there is emotion, a memory or colors, but it is always spatial. Although a relative newcomer to some artists, it is not that I am unfamiliar with David Wenngren’s work, but as for Library Tapes I have some catching-up to do. A while back I reviewed his hypnotic album with Kane Ikin entitled Strangers, and I have both albums Our House Is On The Wall (as the moniker of Murralin Lane with Ylva Wiklund), and The Meridians of Longitude and Parallels of Latitude, his collaboration with Christopher Bissonnette. All are different explorations of sound and place, but Sun peeking through seems more personal. Wenngren’s piano is deftly blended with a spare ensemble of strings. Something a bit different this time; I won’t attempt to describe where Wenngren is taking me, but I will show you where I have been. These are often places I don’t want to leave once I am there (even if melancholy is involved). The title track (to me) is beautiful, almost beyond words—a deeply reflective meditation. David Wenngren as Library Tapes has assembled a collection of poignant vignettes, and a treasured diary of sound memories. And now, off to explore more of his previous recordings. All photos (except album cover) are by wajobu. This is the first joint work created by Kane Ikin (one half of Solo Andata) and David Wenngren (Library Tapes). I have read that “Strangers” Ikin and Wenngren did not meet during the recording and that the structure and overall sonic feel of the album was not planned. This and other similar works mark a continuing re-emergence of instrumental music by a new generation of creative and technically inclined musicians that craft layered sound atmospheres (often referred to as “electro-acoustic minimalism”), yet the music is engaging and stimulating. I have been an avid listener and collector of synthetic electronic music since the early 1970s, yet there is something to be admired about the production of fine instrumental music with an ambience and mystery of electronics, being created with cleverly disguised analog instruments (acoustic or amplified) as well as found, ambient, looped or processed sounds. Historical context: While they abandoned their early legacy when they issued their boxed set “The Catalogue” in late 2009, Kraftwerk’s work started with a similar experimental spirit to “Strangers”, based on analog instrumental drones of guitars, flutes and rhythms of found percussion on pieces like “Kling Klang” from the 1972 album “Kraftwerk 2”. Same with early works by Tangerine Dream and others, before they switched to early sequencers and then hefty modular synthesizers, like the Moog (or later more portable and somewhat less reliable EMS VCS3) as well as tape-based samplers like the Mellotron or Chamberlin. Early works by Evangelo Papathanasiou (Vangelis) were mostly created with organ, clavinet, woodwinds, piano and percussion processed with reverb, delay and other effects, as in “Creation du Monde” from the 1972 soundtrack to “L’Apocalypse des Animaux” by long time collaborator and filmmaker Frederic Rossif. In “Strangers”, there is meandering warmth to the album, a peaceful sense of comfort and meditation with a tangible awareness of humanity and nature (an absence of the synthetic). Layers of guitar, bass, piano (deep soundboard), percussion (low register bells and gongs) and strings appear throughout. From the collaborators there is a joint sense of discovery and response as each layered track progresses. This method of joint remote authorship is risky, yet very intriguing and the results are quite successful. The titles of each track do seem to symbolize the development of the sonic ideas. “Swell” is akin to Ikin’s gorgeous recent work “Contrail” with apparent glissando drifts of guitar and layered keyboard peregrinations. “Call” has the feel of time-shifted incantation with repeated musical phrases. The intensity of the “call” increases as it progresses. While there is a general feeling of the pastoral in this track, there are times where layered sounds mesh to a point of tension, later to be diffused to a calming resolution. “Veil” starts with a repeated tonal beacon and gradually it diffuses into a suspended wash of winds, harmonics and tonal percussives. “Chalk” is hypnotic and haunting with a sense of a distant faded memory returning. “Drifter” contains repeated sampled phrases that establish a building tension as the fabric of the piece intensifies. Washes of noise (almost like lashing waves in a storm) enter the piece until they subside (this piece, to me, does appear to be chopped a bit at the end). “Strings + Interlude” builds slowly, and pulses as layers and sounds are introduced. It has a feeling of darkness, yet it’s punctuated with sounds that introduce light and color into the soundscape. Then the strings disappear and the interlude is a peaceful and mysterious aftermath–this piece, along with “Chalk” and “Swell” are the most cinematic. Gone are the soulless interfaces of MIDI and sequenced boxes of beat, and with “Strangers” we are presented with a thoughtful, visual and distinctive journey into an ethereal realm of musical authenticity.